A Moink Ball? What is that you say? Well, they don't come from little furry Moinks. I am not even sure how the name got started. What I do know is, they are little meaty treats packed with lots of flavor. A Moink Ball is a lot like a Fattie. You can use any meat, any spice, and any stuffing, just so that you can roll it up and wrap it in bacon. For ours, I used sweet Italian sausage. I cubed up some mozzarella cheese into bite sized pieces. I did not add any rub to the sausage mix. As you take a hunk of sausage goodness and roll into a meatball sized shape, I pushed a piece mozzarella into the middle so that you get a nice cheesy surprise when you bite into the middle. For half of the treats below, inserted a jalapeno slice along with the cheese for a bit of spice. 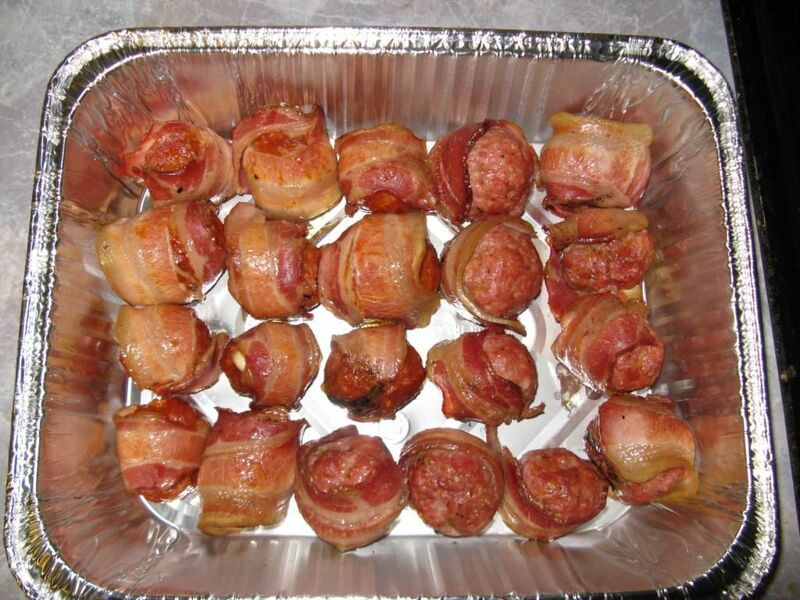 Once the balls are made, wrap with bacon and place on a smoker set for 350 F. I used oak wood for this cook. If you have never tried oak with sausage, you have to give it a try. They were made for each other. Perfect, juicy, morsels of sausage goodness. When the bacon is added, you will peg the taste meter for sure. Make more than you think you need as they will go fast. Serve with toothpicks and a dipping sauce. I used a marinara for these. I can taste them from here. Yum! Moink is short for Moo & Oink. Italian beef meatballs & bacon. Great website Bill. I plan on bookmarking it. thanks for the origin of the name Bryan. Makes sense. glad you like the site. Keep on visiting.